Article first appeared in Southern Brew News. Joey Redner, Petersburg Times beer columnist, grew tired of hearing from Sunshine State beer lovers that Florida needed more craft breweries. Redner decided the time was right to make his dream of brewery ownership a reality, and saw Tampa as the perfect locale - due mainly to the city's rich confluence of cultures and vibrant, colorful lifestyles of its inhabitants. "We feel like we can express some of the essence of the city in our beers, which is why we draw heavily on Cuban food staples in many of our beer recipes," adds Redner. Redner found a creative, talented brewer for his company in Wayne Wambles, and the two located their 15 bbl microbrewery at 3924 W. Spruce Street, in what was once a semi-truck repair shop, just a mile from the Tampa Buccaneer's stadium. Redner's Cigar City Brewing (CCB) will be Wambles' second stint as a Florida brewer - he brewed earlier at Buckhead Brewery in Tallahassee. My biggest challenge really was finding the right brewer," says Redner. "I looked at dozens of resumes and interviewed a handful of people before speaking with Wayne. I wanted someone who was a geek about the process of brewing and technically solid but also willing to take major leaps from a creative standpoint. Wayne filled that bill perfectly. Rather than an employee, I got a partner in Wayne, and he has contributed to many of the beer names and marketing development. Wayne rocks." Wambles started home brewing in the mid nineties. "I read Papazian's first two books on home brewing before I even bought any equipment," admits Wambles. "I started out doing extract batches, and within a year or so I began experimenting with partial mashes. I eventually went so far as to purchase a three-tier brew system from Byron Burch in Santa Rosa, California, and when I reached this point, I began to have a more solid understanding of what I was doing and the amount of control that all-grain brewing allowed me." A brewing job soon followed at Poplar Head Mule Company in Dothan, Alabama. Wambles explains, "I took four of my beers from the brewery down to the Panama City Brewfest and brought home three ribbons out of the four beers I took. The local paper wrote a story on the ribbons, and I heard that Buckhead Brewery & Grill in Tallahassee, Florida was looking for a new head brewer. I took the article down to Tallahassee the day after it came out, basically used it as a resume, and was hired on the spot." Wambles brewed in Tallahassee for three years and won multiple state awards including the Best Florida Beer Championships. In 2000 he brought home a gold medal from the Great American Beer Festival for his Buckhead Strong Scotch Ale and a bronze for his English IPA. A silver for Strong Scotch Ale at the 2000 World Beer Cup followed. When Buckhead Brewing eventually folded, Wambles took an assistant brewer position at Foothills Brewing in Winston-Salem, North Carolina. "Foothills was my first venture into an environment with microbrewery elements. Foothills' Jamie Bartholomaus taught me about marketing strategy, effective logo design, mass keg packaging, self-distribution and raw material purchase strategy. It was exciting and a very busy environment, but I dearly missed having the creative freedom that I once had as head brewer. I updated my resume and sent it to Joey Redner in Tampa, and within a week and a half, he hired me as CCB's head brewer. I moved to Tampa in late March of 2008, and we've been moving toward the onset of production ever since." Wambles couldn't be more excited about his new Tampa brewing gig. 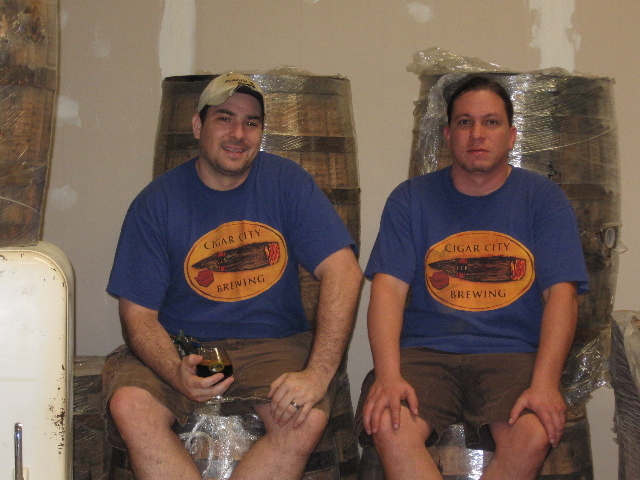 CCB expects to start production by February of 2009, with the first beers being distributed a few weeks later. With only two core beers that will be produced year-round, CCB hopes to roll out a creative array of eclectic, annual, single production seasonal beers. The planned list includes a saison with wild scuppernong grapes, Mayan Chocolate Imperial Stout, Northern English-style double nut brown, oatmeal rye India brown ale, imperial pumpkin ale (Good Gourd), imperial Southern English-style brown ale with Christmas spices (Sugar Plum Brown Ale), and a milk stout with Cuban-style coffee beans (Café Con Leche Stout). Wambles adds, "As a creative twist on wood aging, I also want to condition our Humidor Series of beers on Spanish cigar box cedar. Tampa's Latin Quarter, Ybor (pronounced EE-Bore) City, was once the world's largest producer of hand-rolled cigars, and I've discovered that beers aged in contact with the cedar produces damn tasty flavor components very different from oak. We also have thirteen 53 gallon bourbon casks and will be doing a limited series that will be aged on exotic woods, fresh oak and brandy barrels. There are many more secrets in the midst of all this, but I won't divulge them just yet." Wambles enjoys historical research and incorporates the findings into his beers. CCB's Mayan Chocolate Imperial Stout illustrates a prime example with ingredients such as vanilla, cinnamon, raw cacao nibs and two different types of chilies. "All these ingredients come together in the strong stout to make for a very complex drinking experience," says Wambles. "I get bored with basic styles and enjoy making beers that challenge my palate and the palates of others." Initially, CCB's beers will go on sale at locations around the Tampa area as draft only. Plans then call for putting bottles on the market within the first three months. Wambles states, "We want to make sure that we fine-tune our bottling line and packaging process - we want to minimize dissolved oxygen levels and extend the shelf life of our beers. Our seasonal bottles will most likely be bottle conditioned, and since most of our seasonals will be high gravity offerings, this provides the capacity for long term cellaring so that our beers can continue to evolve over years." CCB's new brewhouse incorporates several bells and whistles that really excite a "beer geek" brewer like Wambles. One impressive accessory is a custom Hermes coil in the hot liquor tank that allows for multiple step infusion mashing in order to create more authentic, traditional styles and increase brewhouse efficiency. Also, the mash tun houses a steam jacket to aid in multiple step infusion mashing and produce potential "pseudo" decoction flavors in the beers. When asked why Tampa seems ripe for a high-end, gourmet, craft microbrewery, Wambles replies, " I believe Tampa is ready for a beer geek oriented brewery. In the last two years, nearly two dozen breweries have come into the Florida market. Despite the flood of new arrivals, we see the public continuing to demand a more specialized product. We see it in the success of organic market places and in the success of small batch, hand-crafted products that are free of processing and have a special, local touch that makes them unique. CCB is going to take this approach every step of the way, and I can't imagine not being embraced by a market that's starved for locally produced, gourmet craft beer." Joey Redner, CCB owner, expresses his closing thoughts. "My biggest surprise is how everything for a brewery seems to cost $1,000 or more. I figured SOMETHING had to cost less than $1,000, but this is not the case. Opening a brewery is definitely a long, expensive process that requires patience. Sometimes things just don't go as you plan or hope, and you have to roll with it. It helps to have plenty of beer around to drink." It looks like Tampa-area beer aficionados will have plenty of fascinating new beers to enjoy very soon. Click on blog.cigarcitybeer.com to see progress photos and read out the trials and tribulations of opening Cigar City Brewing.